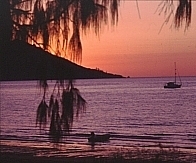 Townsville is a port city for a vast agricultural and mining area of inland Queensland. The main road to the Northern Territory runs west from Townsville. 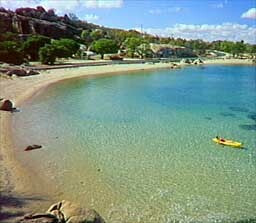 Townsville is also the access point for Magnetic Island. There is a booth in the Flinders St mall open 9am to 5pm weekdays and Saturday, to 12.30pm Sunday. Phone 4721 3660. Mary Who bookshop on Stanley St has internet access for $5 per half hour. Great Barrier Reef Wonderland Aquarium This huge tank with coral, tropical fish, sharks and stingrays is townsville's main attraction. Underwater viewing is from a perspex tunnel. Open daily 9am to 5pm. Entry $13, children $6.50. Nearby is a Omnimax 3D Theatre with fish and reef films ($11.50, children $6) and the Museum of Tropical Queensland ($4, children $2). Rockhampton has a Botanic Gardens planted in 1878 and the newer Anderson Park botanic garden, 6km southwest of town. Palmetum is a garden 14 southwest of town devoted to palm tree species ranging from rainforest to desert varieties. Billabong Sanctuary has a variety of Australian wildlife and animal feeding times. It is 17km south of town on the Bruce Hwy. Entry $18, children $9. Dive schools include Mike Ball Watersports, 252 Walker St, phone 4772 3022. A 5 day course costs $395 with 2 day diving trips or $480 with a three day diving trip staying overnight on their boat. Phone 4772 3022. Pro-Dive has 5 day courses with 3 days/2 nights out on the reef for $480. Phone 4721 1760. The wreck of the Yongala, a passenger liner that sank in 1911 losing 122 lives, is a popular dive spot because of the huge number of fish, turtles and stingrays. Mike Ball Watersports and Pro-Dive run trips from $165. Coral Sea Skydiving Phone 4725 6780. Tandem jumps for $200, freefall courses for $390. Risky Business has abseiling for $54 and giant flying fox for $79. Phone 4725 4571. Pure Pleasure Cruises has 5 trips a week to the outer reef. $130, children $65. Includes lunch and snorkelling gear. Scuba gear is extra. 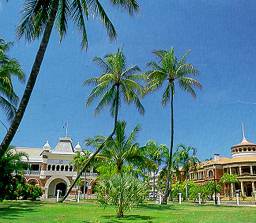 Townsville has two huge youth hostels. Adventurers Resort YHA at 79 Palmer St is impersonal and has 300 beds and pool. A bed in 4 bed dorm is $14, single $24, double $32. Phone 4721 1522. Transit Centre Backpackers is conviently located above the bus station. Dorm $14, single $25, double $32. Includes free city tour. 1800 628836. Globetrotters Hostel 45 Palmer St. Phone 4771 3242. Pool, kitchen, lounge, laundry. $13, single $26, twin $32. Civic Guest House 262 Walker St. Phone 4771 5381. Bed in three bed dorm is $14. Bed in 6 bed dorm with own bathroom and airconditioning is $16. Sigle $28, double $32 or $8 with private bathroom and airconditioning. Coutesy bus pickup. Free Friday night barbeque. Reef Lodge 4 Wickham St. Phone 4721 1112. Dorm $12, single $28, double $32. Most rooms have airconditioning operated by coins in the slot. Flinders St is the main street and has a number of restaurants. The casino has $6 dinner. Ghekko's is staffed by trainee student chefs and caterers. Silver service dinner mains are $9. Open for dinner Wednesday to Sunday, lunch Wednesday to Friday. Nightlife is centred on Flinders St.
Hard Blues Bar at 237 Flinders St is the main live music venue. Bank at 169 Flinders St is the city's a classiest nightclub in the city. Bullwinkle's Cabaret & Bar at the corner of Flinders St East and Wickham St is a popular nightclub. Townsville 5 Cinema Centre is on the corner of Sturt and Blackwood Streets. Sheraton Breakwater Casino is on Sir Leslie Theiss Drive. Qantas/Sunstate and Ansett/Flight West have daily flights to all major cities and rural Queensland. Both airlines have offices on Flinders St Mall. Sunstate flies to Dunk Island for $129. The airport is 5km northwest of town. The Airport Shuttle (phone 4775 5544) is $5 one way, $8 return and will drop off and pickup anywhere downtown. Taxis are around $10. All long distance coaches operate from the transit centre on Palmer St. Greyhound Pioneer and McCafferty's are the major operators with services north and south along the coast and inland to Mt Isa and the Northern Territory. Brisbane (20 hours, $119), Cairns (6 hours, $37), Mt Isa (12 hours, $81). Trains operate along the coast through Townsville three times weekly and west to Mt Isa twice weekly. Economy sleeper to Brisbane are $148, 22 hours. Cairns is 7 1/2 hours for $41. The railway station is on Flinders St.
All major car rental agencies are in Townsville. Smaller rental companies include Rent-a-Rocket (phone 4772 1442), Sunrunner Moke Hire (phone 4721 5038) and Townsville car Rentals (4772 1093). Sunbus has a local bus service. Route maps and timetables are in the Transit Mall near Flinders St Mall tourist information booth. For Taxis phone Standard White Cabs on 13 1008. Magnetic Island just off the coast. Travel west to the Northern Territory passing through Mt Isa. Travel south to Brisbane and the Gold Coast surfing mecca stopping at the Whitsunday Islands off from Airlie Beach, Hervey Bay, Fraser Island and Noosa Heads on the Sunshine Coast. For more locations see the complete Great Barrier Reef page, the Queensland state page or the Australia homepage. Magnetic island is a large continental island (52 sq km) with a few small towns, sleepy atmosphere, white beaches and lots of wildlife and bushwallks. Mount Cook is 500m high. It is not a purely resort island, nor is it on the reef. The ferry terminal andinformation office are at Picnic Bay. Hideaway Budget Resort 32 Picnic St, Picnic Bay. Phone 4778 5110. Pool, kitchen, TV room and laundry. Dorm $14, twin $14 per person, self-contained cabin $45. Magnetic Island Tropical Resort Yates St, Nelly Bay. Phone 4778 5955. Pool, restaurant, garden. $16 for bed in a 6 bed cabin with bathroom, $45-$80 to rent a whole cabin. Coconuts on the Beach Nelly Bay. 1800 065696. Dorm $16. Promotes itself as a backpacker party place. Centaur House 27 Marine Parade, Arcadia is a friendly relaxed place in a rambling old hostel opposite the beach. Phone 4778 5668. Dorm $15, double $35. Foresthaven 11 Cook Road, Arcadia. Phone 4778 5153. Dorm $14, twin/double $34. Self contained rooms $25 per person. Friendly owners speak German and French. Geoff's Place Horseshoe Bay. Phone 4778 5577. Bed in cabin $14. Communal kitchen, bar, eatery. Courtesy bus to meet ferries at Picnic Bay. Sunferries operates 10 services a day between its Flinders St East terminal in Townsville and Picnic Bay on Magnetic Island from 6.20am to 7.15pm. The trip takes 20 minutes and costs $7. Magnetic Island Ferries runs from the breakwater on Sir Leslie Theiss Drive in Townsville to Picnic Bay daily from 6am to 7pm, later some nights. The trip takes 15 minutes and costs $14 return, students $11. Capricorn Barge Company has a vehicular ferry which run from the south bank of Ross Creek to Arcadia four times weekdays and twice a day at weekends. Cars and up to 6 passengers are $96 return, motorbikes $31 return, walk-on passengers $12 return. Bicycles free. Magnetic Island Bus Service has 10 to 20 services a day from Picnic Bay through Nelly Bay and Arcadia to Horseshoe Bay and back. They meet all ferries and drop off at all accomodation places. Single fares are $1.50 to $3.50. Daily ticket is $9. Cars and mopeds are available for hire from and around Picnic Bay Mall. Expect to pay $30 for a moped for a day. Bicycle hire is available from Picnic Bay esplanade, Foresthaven at Arcadia and Horseshoe Bay waterfront. Copyright (c) 2000 Graham Warren.